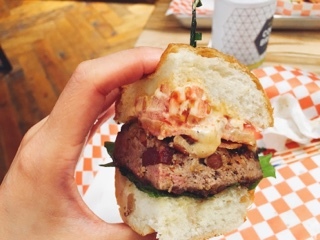 It’s no shock that Torontonians like bacon … after all, when your city’s nicknamed “Hogtown” its constituents will know a thing or two about pork. Wife and husband duo, Julie and Richard, is fulfilling Toronto’s love for the ingredient with a new Rasher’s location in Ossington. The restaurant first started when Richard discovered Toronto lacked the beloved bacon sandwiches he ate with gusto in the UK. Sure, there were restaurants that offered peameal versions or others topped with the typical strip bacon, but none offered the British style he craved. With the ingredient not being produced in the city, the duo eventually convinced Perth Pork Products, a farm near Stratford, to produce the cut for Rashers. 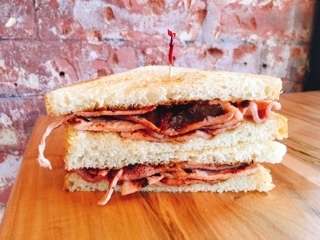 The British bacon is best showcased in the Bacon Butty ($8), a simple sandwich combining the meat on toasted white bread and brown sauce. Thank you Rashers for introducing Toronto to this cut, my favourite of the night! 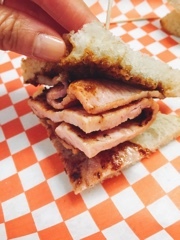 The British bacon combines the meatiness of peameal with some of the belly fat on the strip to add flavour and moisture. The house-made brown sauce is like HP, a combination of 24 different ingredients to give the dish a vinegary Worcestershire kick. Surprisingly, even with the sheer amount of meat, the sandwich doesn’t feel heavy. Nursing a hangover? 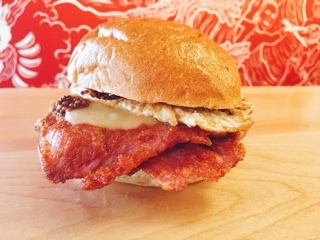 The Hogtown ($8) with fried egg (an extra $1) would be perfect for calming any queasiness. Plenty of sliced peameal, a slightly runny fried egg and a soft bun makes for a hearty sandwich. I only wish there was less of the ale mustard – although it’s nice and grainy, I found the sheer amount starting to cover the meat. 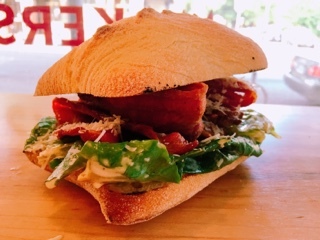 If you like your bacon crispy, the Bacon Caesar ($9) crams in ample strips of the smoky variety topped with crisp garlicky romaine laced with parmesan. The ciabatta bun could be replaced with something thinner, but the hard bread could be a nod to croutons. 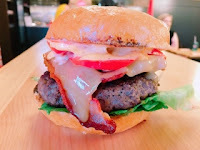 The Bacon Burger ($11) is definitely for meat lovers: starting with a thick ground beef patty stuffed with diced bacon and then more strips on top! As a warning, the patty is thoroughly cooked so the burger is rather dense - not crumbling and moist if that’s what you prefer. 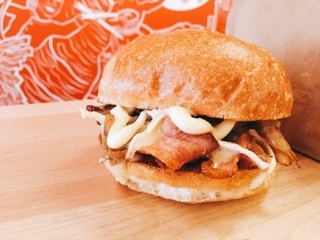 A great combination is the Brie & Bacon ($10), the crispy strips covered with sweet caramelized onions, gooey melted brie and a creamy garlic aioli. The sandwich is delicious and decadent; what a flavourful concoction despite the plain looking exterior. 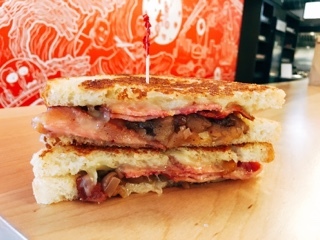 Grab the Apple and Maple Grilled Cheese ($9.50) if you’re in the mood for something sweet and savoury. It’s still a fairly savoury sandwich from the salty bacon, melted cheddar cheese and buttery bread. But, the apple chutney mixed with cinnamon gives it a sweet spike … reminding me a cheddar cheese apple pie. Yum! 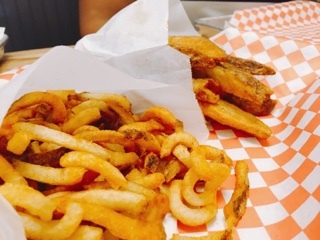 Don’t even think of ordering a salad - Rasher’s only sides are hand cut wedges ($4) or curly fries ($4). With a choice of seasoning (roasted garlic or smoked paprika), they are hot, crispy and satisfying. 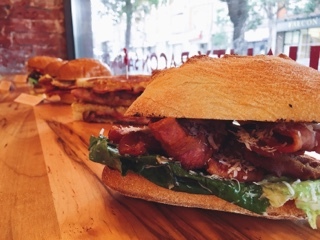 Rasher’s menu boldly encourages substitutions – for me I’d change the meat in any of the sandwiches with the British bacon, what an amazing cut. 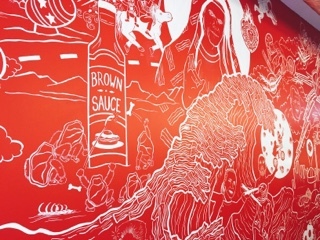 And maybe if you’re feeling especially adventurous, how about one that combines all three?